You are here: Home / Galaxy Note 4 How-To Guides / How to manage and download Galaxy Note 4 camera modes? [easyazon_block add_to_cart=”default” align=”left” asin=”B00EH5UGR6″ cloaking=”default” layout=”top” localization=”default” locale=”US” nofollow=”default” new_window=”default” tag=”net7749-20″]Galaxy Note 4 has one of the best camera sensors you can get in 2014. The companion Camera app is also very user friendly. But for some users, you may wonder where the camera modes are, and how to get more camera modes for Galaxy Note 4. This guide will show you how to manage Galaxy Note 4 camera modes and how to download and install more Galaxy Note 4 camera modes. Since Galaxy S5, Samsung tried to simplify the camera app so that it is not overwhelming for new users. In Galaxy Note 4, several camera modes (e.g., night mode) are combined into auto mode. Some modes are not shown by default and you can turn it on in the camera app. A few camera modes are not pre-installed and you can download and install them. How to manage Galaxy Note 4 camera modes (turn on/off some camera modes)? Start Camera app in your Galaxy Note 4. Tap MODE as shown below. 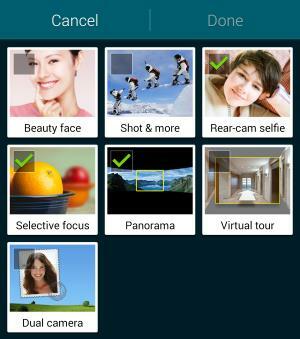 You will find, by default, only 4 camera modes including Auto, Rear-cam selfie, Selective focus and Panorama are shown. Some other modes are installed, but not enabled. There are actually 8 (depending on your region) pre-installed camera modes in Galaxy Note 4. Other 4 camera modes are not activated by default. Please note Auto mode is always enabled and you cannot disable it. So, it is not listed when you tap the manage modes. The camera modes checked here are enabled and are usable in camera app. Others (not checked) are not activated. Once you finish the selection, tap Done as shown below. Now, you can use all of the 8 pre-installed camera modes in your Galaxy Note 4. Please note, the number of pre-installed and enabled camera modes may vary from regions to regions. How to download and install new Galaxy Note 4 camera modes? In addition to the 8 pre-installed Galaxy Note 4 camera modes, you can also download and install additional camera modes provided by Samsung. Some Galaxy Note 4 owners may complain about this arrangement. But this is actually a good move. Decoupling some features from pre-installed core apps makes it possible to update such features without waiting for firmware update (which needs carrier approval individually). 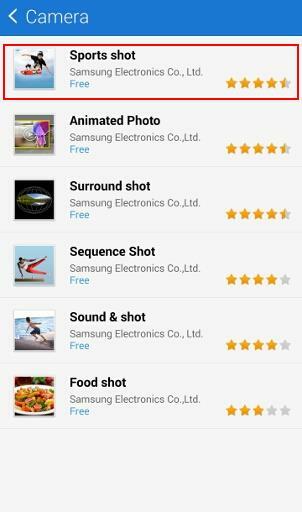 To download additional Galaxy Note 4 camera modes, tap Download as shown below. This will open some hidden pages in Galaxy Apps as shown below. These apps are hosted in Galaxy Apps, but you cannot access them directly from Galaxy Apps. The only way to access them is from your Camera app. Currently, there are 6 additional camera modes for your Galaxy Note 4. These include: Sports shot, Animated photo, Surround shot, Sequence shot, Sound & shot and Food shot. You need install them one by one. Samsung does not provide bulk or package installation for these camera modes. 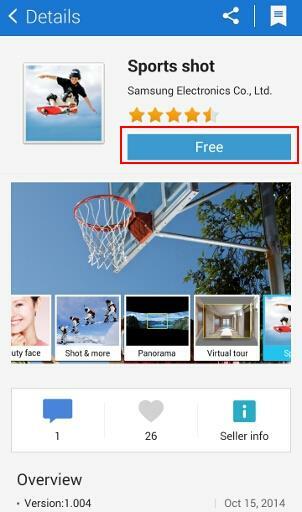 For example, you want to install Sports shot. Tap Sports shot as shown below. In Sports shot details page, tap Free as shown below. Just like normal apps, you need acknowledge the app permissions. 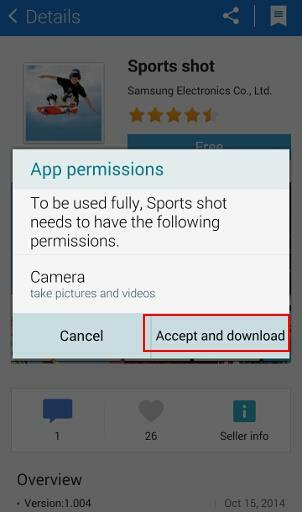 For Sports shot, of course, it needs the permission to access Camera app. Tap Accept and download to proceed the installation as shown below. 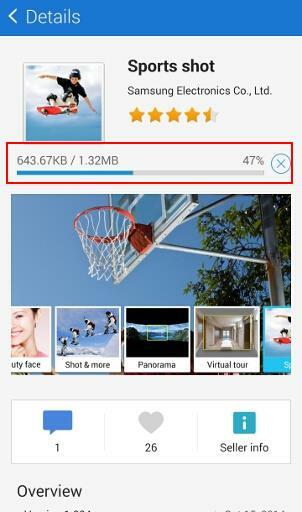 Now this camera mode (Sports shot) will be downloaded and installed to your Galaxy Note 4. Once the installation is done, the Sports shot mode will be activated automatically and is ready for use as shown below. Of course, if, for any reasons, you want to deactivate it, you can tap manage modes to manage it as pre-installed Galaxy Note 4 camera modes (as mentioned above). You can download and install other Galaxy Note 4 camera modes similarly for your phone. For the front facing camera, Galaxy Note 4 provides special modes for selfiers: Selfie mode and Wide selfie mode. Can you manage and download Galaxy Note 4 camera modes now? Please post your questions and comments on how to manage and download Galaxy Note 4 camera modes in the comment box below. You are also welcomed to post your own tips and tricks of managing, downloading and using Galaxy Note 4 camera modes. You can try to reset camera app in settings – application manager – camera. Tap clear cache and clear data to reset camera app. This does NOT affect your photos. Your can also try Google camera app to see whether you have the identical issue. I wonder, why disabling and enabling camera modes like that is no longer possible with TouchWiz NatureUX 5.0. Do you have the modes button on the camera app? I have install Marshmallow 6.0.1 and options disappear and all those modes. Very likely, you are in easy mode. Switch back to standard mode in settings -easy mode. My favorite mode was Beaty Face mode. How to get it for Note 5? In Note 5, you can also download the beauty face mode. Did you get any errors when downloading this camera mode for Galaxy Note 5? What ever happened to the “best face” feature like on my note 3. I used that all the time with my kids? is it still available? It’s gone. You have to use other modes instead. I believe you can use Shot and More Mode to choose best photo. You need switch to rear camera before tapping mode icon. Thanks for your response. Unfortunately I have already tried that…No luck. As mentioned, it used to be there, but now it’s gone. Can’t even find it in the Samsung “Download camera mode”. Very strange. You can also try to clear cache and clear data for camera app in application manager. Then try again. I don’t think this camera mode has region restrictions. Thanks again. Been using that trick for awhile. Unfortunately it hasn’t helped. Good to know, however, that there aren’t any region restrictions. I’ll keep looking for an answer, and if i found one I’ll let you know. My food shot mode stop working, I keep getting pop up saying unfortunately food has stopped..please help. You can uninstall it in application managers. Then install it again. Sometimes, a reboot may also solve the issue. Normally there should be no issues in auto mode because of the ois in Note 4 works quite well. Anyway, you can try auto mode or download sports mode. When you take photos indoor, turn off HDR. I used to have amazing settings on s3 for sunset and sunrise…where are these now? The auto mode does nothing to enhance like the s3 did…SI many lost sunrise opportunities ! All these modes are incorporated into auto mode. The phone is smart enough to know the light conditions and choose proper settings automatically. I disagree that the phone is smart enough to read my mind and know what I want.The modes in the earlier phone models allowed you to choose a setting, almost like an effect, my favorite was to use the Autumn Color scene setting during a sunset. It gave fabulous colors. Are you saying that is no longer an option? The sensors only knows the conditions of the environment, not what you want to do. I understand what you want, but for smartphone camera, you are limited to the modes and effects offered by the app. Different camera apps may have different options. You may check some other third-party apps. In Note 5 and (S6), the Pro mode gives you more controls. But it is not available in Note 4. The food mode is suppose to produce more vivid colors. Perhaps that mode might work? are you in easy mode? You may switch back to standard mode in Settings–easy mode. Help.. In Shot & More mode, after taking picture, in editor, there were Best Photo, Best Face, Drama Shoot, Eraser and Panning Shot. Only Best Photo and Eraser can be use. How to activate the rest? I usually need to take photos at 1/125 sec cuz of tremor. Does the sport setting have such a setting? I don’t think it has this setting. Got a note 4 recently. Am trying to download Animated Photo. Installation keeps failing with a (-18) error. Any ideas? You need setup a Samsung account. Do you try to install any other apps from Galaxy Apps? I think their server was down or something. I tried it this morning and it worked, lol. Thanks though :D.
Can you check or install other apps from Galaxy apps? 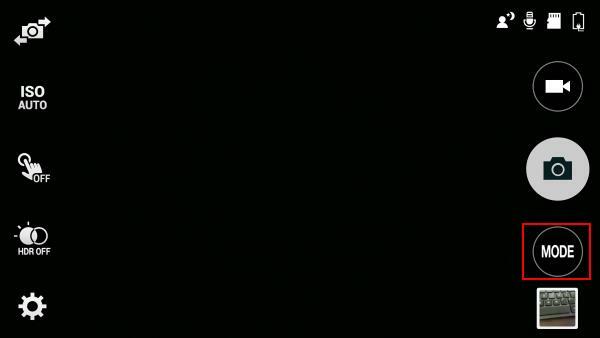 You can try to reset the camera settings. Start camera app, tap settings – more — reset settings. Night mode is incorporated into auto mode. You just enter auto mode, galaxy Note 4 will make judgement base on info from various sensors. My note four does not show Manage Modes so I am unable to dowload more. Also, there is no settings icon and I cant zoom the camera. You are probably in easy mode. Go to Settings–Easy mode. Switch to standard mode to see all options. thank you !! you are the best! !